The sharp slide by Indian rupee to 72/USD is nothing less than a shocker for the economy and investors. The rupee has depreciated by about 13 percent so far in 2018 and has fallen from 70 to 72 per dollar in 21 sessions. The currency hit a low of 70/USD on August 13 and since then, it has moved in just one direction and that is on the downside. It touched 71/USD on August 31 and 72/$ on September 6. In comparison, benchmark indices have risen over 1 percent since August 13 when the rupee touched 70/USD for the first time in history, but high beta small and midcap stocks suffered the most. Select stocks in the S&P BSE Small and Midcap indices slipped 20-40% in the same period. The S&P BSE Sensex rose by about 1.6 percent or nearly 600 points during this period. The S&P BSE Midcap index gained 1.3 percent, and the S&P BSE Small-cap index edged higher by about 1 percent. However, weakness was seen in over 50 high-beta smallcap names which include Intrasoft Technologies, Ok Play India, Camlin Fine Sciences, Indosolar, DB Realty, PC Jeweller, Mangalam Drugs, etc. 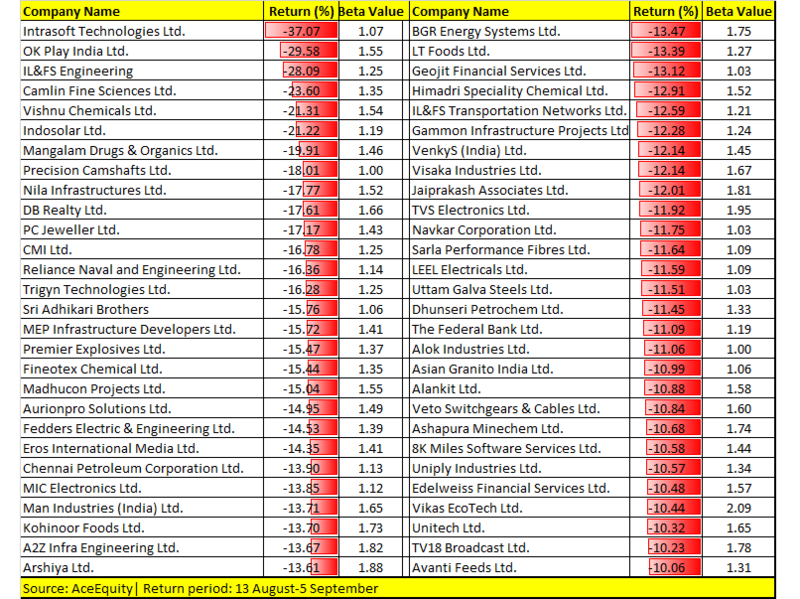 In the S&P BSE Midcap index, as many as 8 stocks have plunged in double-digits since August 13 which includes Bharat Electronics (down 20%), Reliance Communication (down 15%), Federal Bank (down 11%), and Mangalore Refinery (down 10%). If we look at the three episodes in 2012, 2013, and 2014 when the rupee was weak, data suggests that mid & small-cap stocks usually come under pressure whenever the currency depreciates. The Nifty50 and largecaps managed reasonably well, exiting each episode with a less than 10 percent loss or small gains. “Midcaps had significant and painful sell-offs in 2011 and 2013, but attractive gains in 2014,” Sunil Sharma, Chief Investment Officer, Sanctum Wealth Management told Moneycontrol. “While definitive statements can’t be made because each cycle is different, clearly this suggests caution with respect to mid and small-cap exposure until currency depreciation stabilizes,” he said. In terms of sectors, IT and Pharma clearly benefit from a depreciating rupee. FMCG benefits due to the inelasticity of demand for fast moving goods, and the ability of most FMCG companies to pass on price rises. The Indian rupee touched a fresh low of Rs 72/USD largely weighed down by concerns over rising crude prices, simmering trade tensions, weak local equity markets, broad strength in the US dollar (dollar index up about 0.5%) and weakness in the emerging market currencies. Tracking the momentum, the rupee could well touch Rs 72.50-73/$ in the near-term. Experts suggest that companies with high foreign debt will be impacted by the increased debt servicing caused by falling rupee. “All emerging market currencies are depreciating against USD and fall in Rupee is part of it. Investors at this point in time should avoid sectors like OMC’s, banks, and aviation which will be negatively impacted by the fall in Rupee. More than the direction RBI is worried about the pace at which Rupee is depreciating and is trying to defend Rupee by market intervention,” Priyank Upadhyay, AVP Commodities Research, SSJ Finance & Securities. “In the near term, we could see a resistance around 72.20/72.50 and we could see a dip lower towards 71.30/70.40 and from there we can gain see a rally towards 72.75/73.20 zones,” he said.